NOTE: TOTAL SHOWN IS DISCOUNTED PRICE. 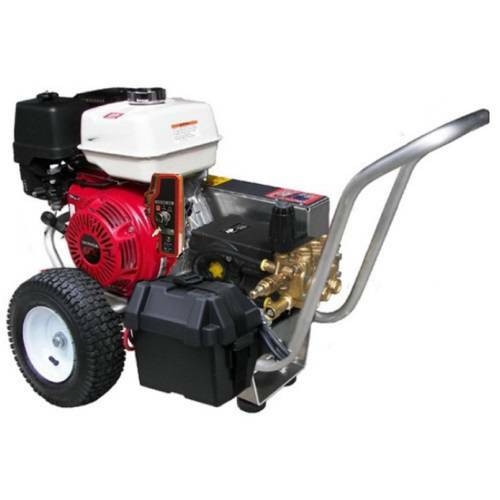 This 4.0 GPM at 4300 PSI electric pressure washer comes standard with the reliable Honda GX 390 electric start engine. Comes with a Belt Drive HP Series General Triplex Plunger Pumps. In addition to superior warranty coverage, this durable and enduring pressure washing machine features a thermo-sensor that prevents the pump from overheating. It also has a low oil shutdown mechanism to ensure you never run this unit without the proper amount of lubrication, thereby protecting your investment from potential damage. Finally, this Honda pressure washer comes complete with an attachment kit and all of the necessary accessories so you can get to work right away. Simply gas the washer up and you're ready to roll. This Water Cannon Pressure Washer includes an Upgraded External Recirculation Plumbing Feature that cools the water while the Trigger Gun is closed. The extended service life Triplex Ceramic Plunger Pumpholds up to commercial and professional daily use. Additionally this model includes an overheat safety valve that will open and closeautomatically to allow the recalculating higher temperature water to be released and allow cool water to replace it, helping to protect the wearparts. There is an optional Adjustable Pressure & EZ Start Feature available SKU 11234 available by calling 1-800-333-9274 and speakingwith one of our industry trained sales team. Our all lightweight aircraft grade aluminum frame has a lifetimewarranty and boasts easy maneuverability good balance and has no weldsto fracture or break. The cool deck frame helps dissipate excess heatfrom the engine and pump giving your components added longevity makingthis purchase a lasting investment. Two oversized fully pneumatic airtires have twin stainless steel ball bearings mounted on a virtuallyunbreakable 3/4 inch cold-rolled steel axle. The two shock-absorbingfeet provide a stable platform and reduce vibration and eliminate"Walking" during operation. The two handles protect your Water CannonPressure Washer during transportation and ensure easy loading orunloading from the jobsite. Shipping & Assembly Note: Our models pass a 15 point inspection. They are factory assembled, tested in the USA and delivered professionally boxed. This Honda pressure washer will arrive at your door ready to operate; we even Armor All the tires!